I'm stuck. I'm well and truly stuck. I've tried to understand - and failed. Julia of Plot 108 has tried to help me out. 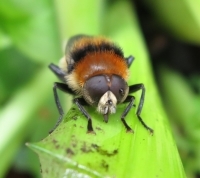 She's given me some very useful links (here's one) - but I'm still lost. I really can't understand ivy. I see it creeping on its little feet behind the loose bark of trees, burdening branches, pulling down walls. I know you can grow a new plant if you cut off a piece that has toes - but when it comes to its flowers and berries - I'm lost but entranced. 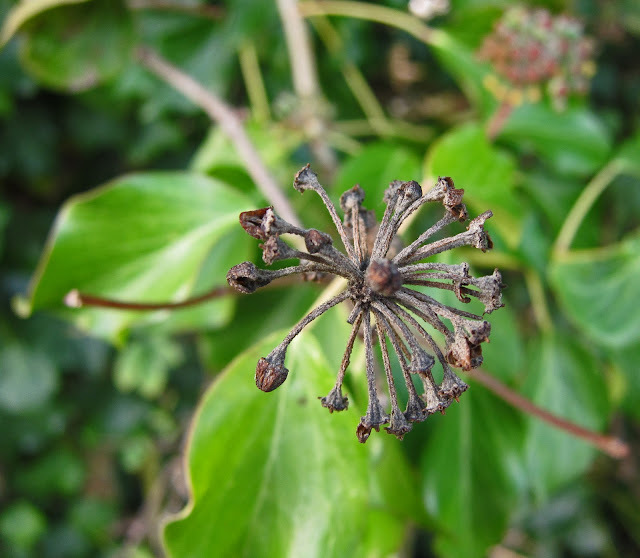 Ivy persists and blunders its way into almost anything. Ditto me. In the true spirit of this blog, I will not let ignorance get in its way. 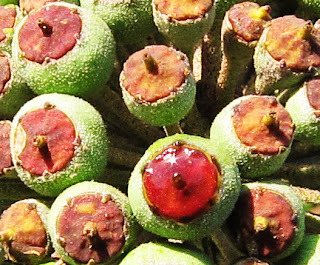 When the berries are ripe, they will be black. They are far from this yet but all sorts of other stages are around together so, by posting before the sequence is complete, I hope these pictures will encourage you to go and look for yourselves. Ivy produces flowers only where it is sunny - and it is often allowed to thrive only in shade - which is why many of us are unfamiliar with what they look like. And where it flowers, its leaves change. 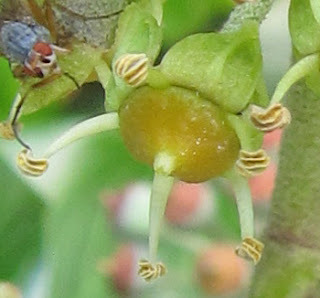 They become elongated instead of heart shaped. And why do I talk of explosions? . . . 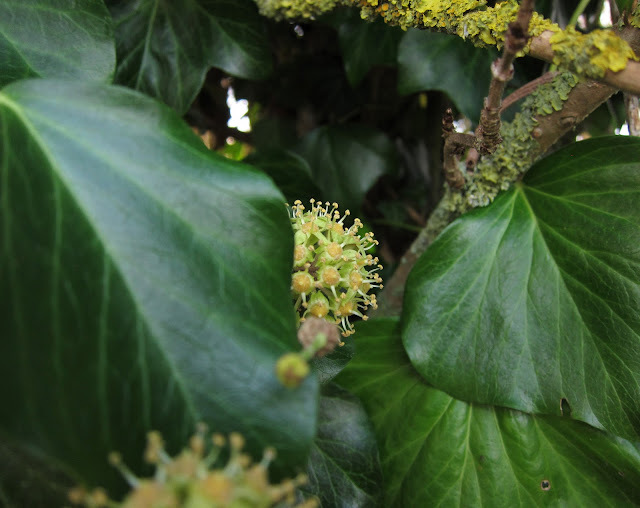 I first began taking photographs of ivy at the beginning of November, just when our town had a firework display. I'd always assumed the huge ones with which such events always end represent chrysanthemums. Now I know I've been wrong. They are ivy. Not all of them make it . . . 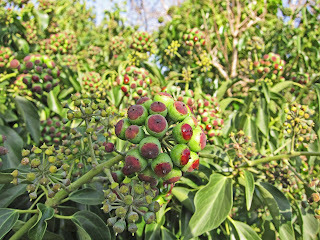 But many do - and, when they are ripe and black and it's time to sing carols about them - it will be Christmas! 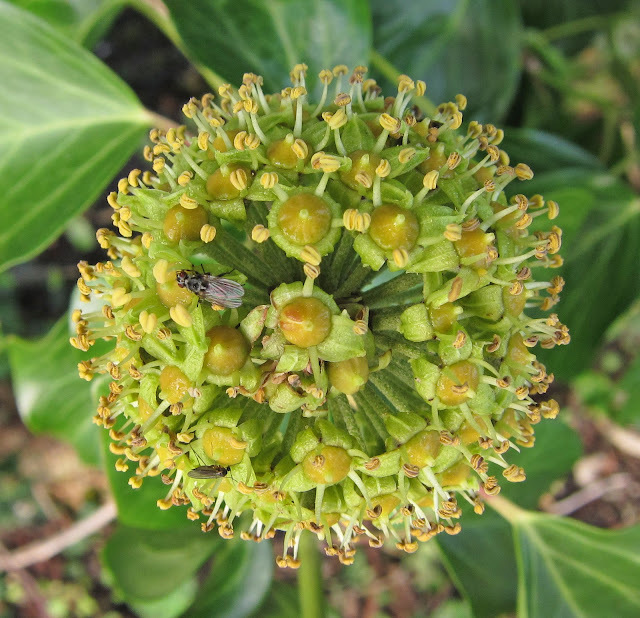 Phil Gates who writes the blog is a Botanist at Durham university. Top chap! 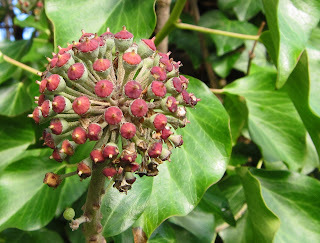 How weird of me to have noticed ivy berries, but never the preceding flowers! 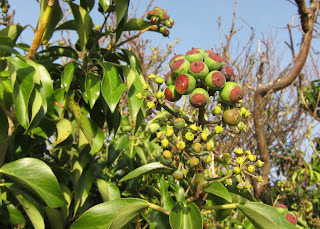 I think they're great plants and the birds do too; the blackbirds in the garden back home will sit for ages munching on the berries. 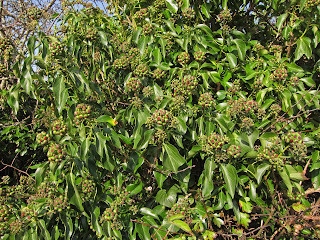 We have sun, but I've only seen ivy flowers 'n berries in Christmas carols. They remind me of posh chandeliers! 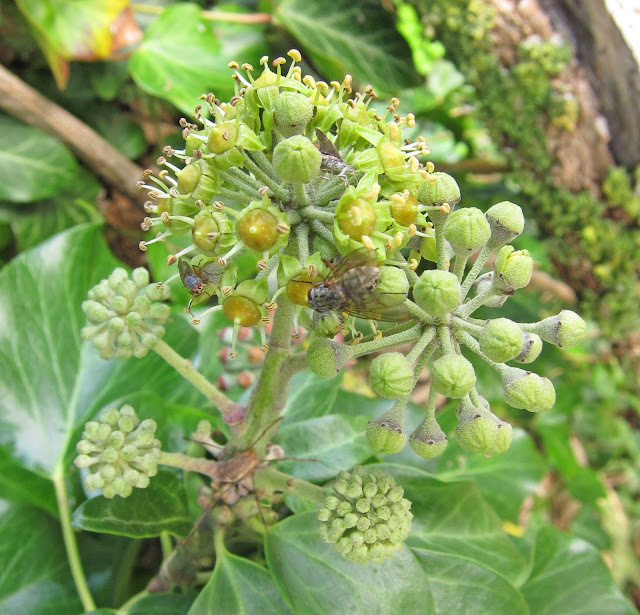 Ivy flowers are beautiful and the plant itself is a wonderful resource for birds and insects. I have quite a big area of it on the wall at the bottom of my garden, it's left deliberately for wildlife and provides food and shelter in the worst of the winter weather. I love it. Who would have thought that something as common as ivy would look so stunning in close up. 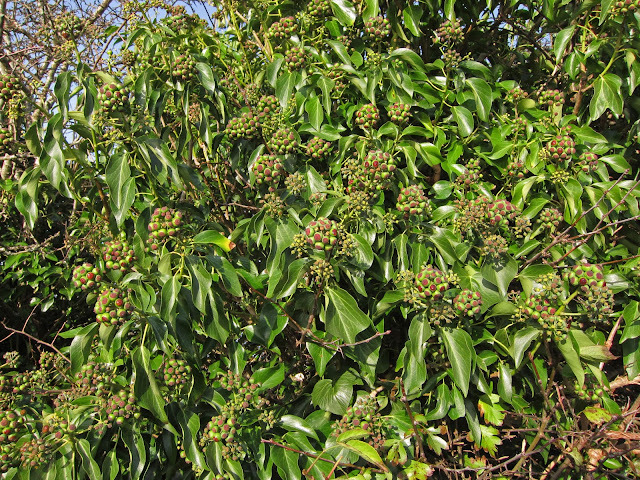 I have Ivy around three sides of my garden and until recent years chopped it down regularly. 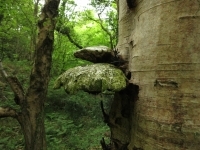 It seems to like that and grows back with avengance so I have left it alone although it is taking over. I am even getting use to the smell! 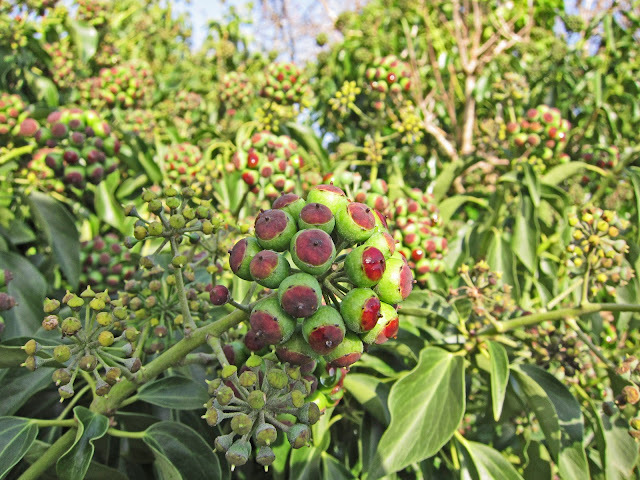 I have never seen the flowers or berries...how amazing.. I'm going to look at the ivy flowers in greater detail from now on as those flowers are quite pretty. I like your version of what this plant represents. Cute, and squiggly. Great shots, I will never look at Ivy the same way again.